The terminalia chebula (Harida) tree grows in deciduous forests and is almost 100m high. The leaves are oval and arranged opposite. The fruit is a drupe, small and nut-like. The seeds are elliptical in shape. The flowers are monoecious, dull white to yellow in colour. It is one among the ‘Triphala’. The seed of the plant is sweet, but the fibre part is sour in nature. The fruit rind is bitter and the seed is astringent in nature. The fruit is hot in nature. It is grown throughout India. It is found in Andhra Pradesh, Tamil Nadu, Kerala, Karnataka, Assam and Himalayan regions. The plant is native to South Asia, Nepal, China, Sri Lanka, Malaysia, Vietnam, Bhutan and Pakistan. The plant grows well in dry and deciduous forests. It is also found in Arabian Peninsula, Indonesia and Java. Haritaki is useful for the treatment of liver and spleen enlargement. Chewing the fruit of terminalia chebula enhances digestion. It clears and cleanses the bowel. It also used to treat a cough, cold and asthma. It is used against food poisoning and detoxifies the body. Terminalia chebula is believed to improve skin complexion. It promotes bowel movement and relieves inflammation. Harida is useful for skin diseases and cures scabies and other infections. The powder of this is useful for the treatment of bleeding, losing gums or gum ulcers because of astringent nature. It heals and fills several kinds of wounds. It also brings down temperature in early stages. It clears several types of heart diseases and useful against stroke. 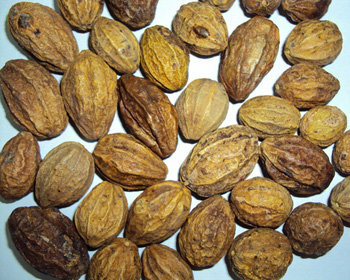 Harida is also used for lowering the cholesterol. Terminalia chebula is useful against vaginal infection, cleanses ulcers and reduces swelling. It is used for mouthwash and gargle. It protects liver and respiratory system. Harida also useful for the treatment of a sore throat and used as a lotion for sore eyes. It is used against constipation, colic pain, and indigestion. 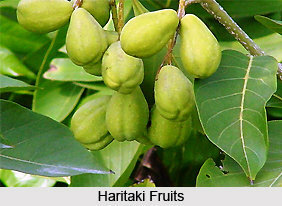 Haritaki is helpful against chest pain, vomiting, high blood pressure treatment and cardiac arrest. It useful for HIV sexually transmitted diseases. It can be used as water pill against ear pain. It increases longevity and clears kidney stones. It increases the receiving power or sensory organs. It cures leucodermia in some cases. It enhances memory power and wisdom. Haritaki is useful for jaundice and parasitic infection. The whole plant possesses high medicinal value and has been proved most useful since time immemorial. Side effects have not been noticed. It has been proved useful for children for treating cough, cold, indigestion, and dysentery. The information presented on this website is not intended as specific medical advice and is not a substitute for professional medical treatment or diagnosis. Home remedies & best natural treatment Copyright © 2019.